At the moment I am working at The Queen’s Gallery running creative writing workshops to accompany their current exhibition, Painting Paradise, The Art of The Garden. I spend a lot of my time staring at this incredible picture. 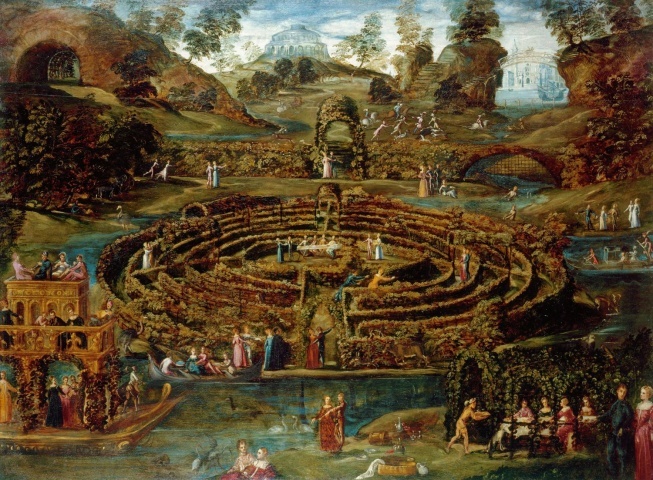 It is called Pleasure Garden with a Maze and it is one of the earliest existing depictions of a garden labyrinth. It was painted around 1570 by Lodewijk Toeput. There is so much happening. Dancing, singing, hunting, swimming and canoodling. There is music, feasting, cavorting in gondolas and even the odd ostrich to chase. And at the heart of the image is the labyrinth. The giant puzzle with only one way in and a series of concentric circles leading to a central point. The maze is a warning about the temptations to linger and make the ‘wrong’ choices. Can you guess what animals the artist has drawn to depict the five senses? I was amazed to discover images of labyrinths in ancient cave paintings. Perhaps the best known labyrinth myth is the story from Ancient Greece about Theseus slaying the Minotaur. Have you ever got lost in a maze? I hope this picture inspires your writing. The exhibition is on until October so try and persuade your teacher to bring your class along. We run sessions for key stages two, three and four. Previous post ← Elspeth Hart goes on Tour!